Go ahead, just try to beat Brian. Use the Arrow Keys to control the Meteor-X. Up accelerates, Downdecelerates, Left and Right turn the ship. 75,000 points: ARMOR – Asteroids do less damage when they hit. 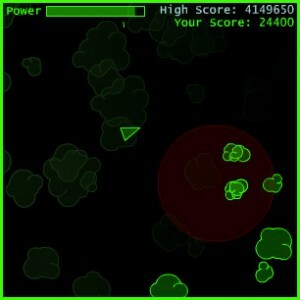 150,000 points: REGENERATION – Your ship will slowly regenerate health. 200,000 points: LONGSHOT – Your bullets will never disappear.